These beautiful delicate snowflakes may seem complicated, but they're actually super-easy to make. Follow the tutorial to create your own snowflake Christmas ornaments in two ways: with hama beads, and by folding and cutting paper. They're both quick and easy techniques with gorgeous results and they will inject some instant holiday spirit into your home. 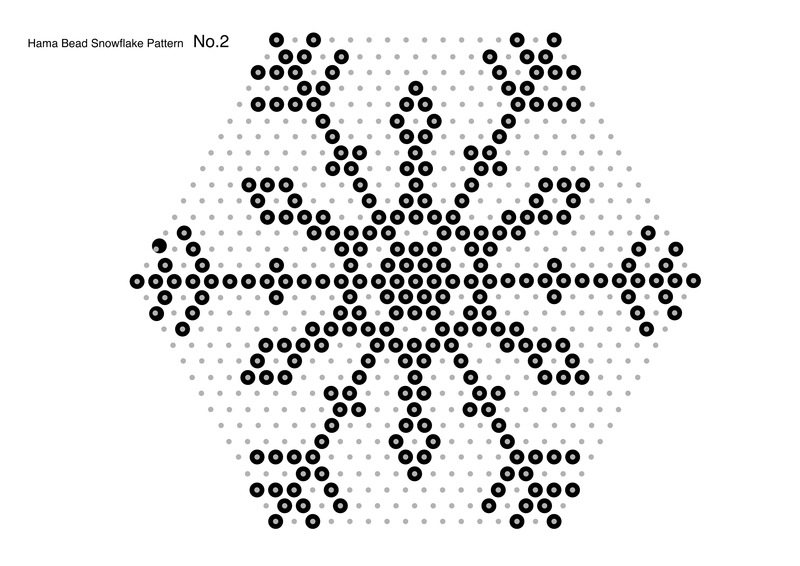 Download the first template for a monochrome hama (or perler) bead snowflake. 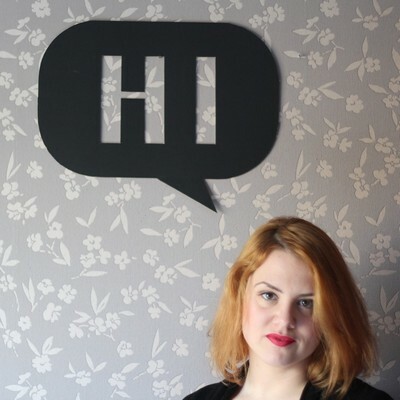 You don't necessarily need to print it out, but you can use it as an on-screen guide for your design. You can add more colours if you like, but for better results, try to keep the design symmetrical. First, carefully lay your beads along a diagonal, from one corner of the hexagon base to the other. You may find it more convenient to use tweezers. Continue by placing beads along the other two diagonals of the hexagon base. At this point, copy the center of the design following the pattern. Add the beads in the center of the snowflake and form the double star shape. Finish the design by adding the beads on the six corners. Well done. Your first snowflake is ready to be ironed. Make sure the pegboard is placed on a heat proof surface like a ceramic tile or a tray. Now, cover your beads with ironing paper (or silicon baking paper) and set your iron to its hottest setting (linen) and turn off the steam function. Carefully iron your design, making sure all beads stay in place. Go over the snowflake with circular movements and try to apply heat evenly. This process is fast, and it will take you around 15-20 seconds in total to fuse your beads together, so don't overdo it. As the ironing paper is transparent, you will be able to check when the beads are fused together. As the design doesn't cover the whole surface of the pegboard, the trickiest part is to evenly distribute the heat across the snowflake, from center to corners. Remove the ironing paper and leave the snowflake to cool. Once cooled and firmly fused, remove the snowflake from the pegboard. Be gentle as it is a delicate design. Flip it over and place it back on the heatproof surface with some ironing paper. Cover it with ironing paper and iron it once more, to get a flat even surface on the back side of the snowflake. Now remove it from the heat-proof surface and place some heavy books on top. The books will keep the snowflake flat, as the beads have a tendency to curl up while cooling. Once the snowflake is cool, it's ready to be hung. Cut a piece of string about 40cm (16 in) long. Pass the string through one hole of the design. Now fold one end to form a loop. Make a knot near the snowflake and trim off the excess ends. Ready! Well done! Here is the pattern for the second snowflake design. Follow the pattern and copy the design on the pegboard. Then follow the same procedure described above to iron and fuse the snowflake. Repeat the process to create as many ornaments as you want. They look gorgeous in white, too! Now that you know how it works, you could try creating your own snowflake designs with hama beads. Keep in mind that you should create a symmetric design, with one basic triangular design repeated six times around the hexagon. And also make sure you have enough connection points and a strong center. Now, it's time to make a snowflake using plain white paper. You will create an octagonal snowflake design with this method. First, place your paper on the working surface in a landscape position. Fold the top left corner downwards so that the left edge aligns perfectly with the lower edge of the paper. Crease well. Now cut off the right vertical part of the paper, using the folded edge as a guide. Open up the paper. You have now created a square to make your snowflake. Fold the square in half, bringing the upper edge downwards to meet the lower edge. Fold once more in half; this time bring the left edge towards the right and crease well. Now rotate the small square clockwise. Make sure the fold is oriented upwards and the open flaps downwards. Now bring the upper left corner downwards to meet the lower right corner and crease well. Fold once more so that the upper diagonal edge aligns with the right edge, and crease. Trim off the excess triangular part at the bottom. 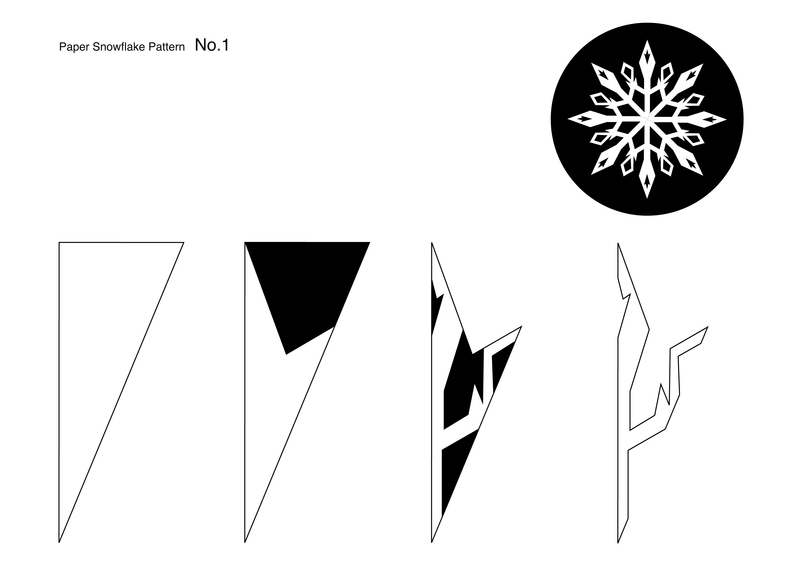 This is the pattern for the first paper snowflake design. You can see the end result in the upper right corner of the template. The triangles at the bottom show the process of cutting in steps. Cut out the black areas in the triangles to create your design. Flip over your triangle. Place it so that the folded edge is on the left side. Now transfer the design of the pattern on the paper using a ruler and a pen. Cut off carefully the marked shapes following the steps on the template. Wow! Your octagonal paper snowflake is ready. Well done! Here is the second paper snowflake design. Cut and fold the paper following the steps described above. Draw the second design on the paper. 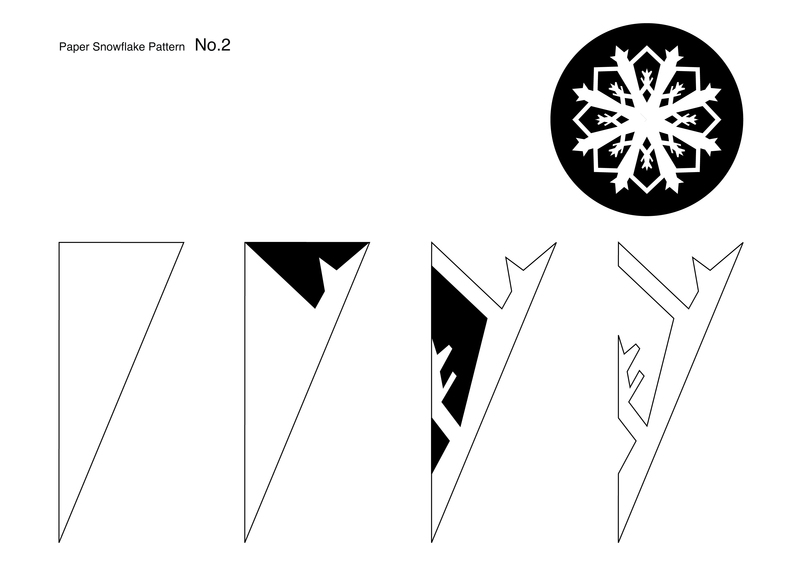 whatever you draw on the triangle, it will get mirrored and multiplied to form eight similar parts of the snowflake. simple cuts can have an impressive end result! In this tutorial you learned how to make two different amazing snowflake ornaments for your Christmas decor. First, you learned how to make snowflakes using hama beads (perler beads) and a hexagonal pegboard. The second method involved folding and cutting paper. Now it's time to deck the halls of your home with beautiful snowflakes. You can hang the hama bead snowflakes on your Christmas tree, or tie them to parcels as an extra decorative gift. The paper snowflakes can also be used to decorate plain kraft paper parcels, or you could make a stack of them for a pretty snowflake garland. Which method of snowflakes do you prefer: beads or paper? Please use the comments section below for any questions or ideas! Merry Christmas, everyone, and let it snow!